During his trial, Groening acknowledged “moral guilt” for the role that he played at the concentration camp. Former SS soldier Oskar Groening leaving court. A FORMER NAZI SS guard known as the “Bookkeeper of Auschwitz”, now 96, is fit to serve his four-year prison sentence, a German court ruled today. Oskar Groening was found guilty in July 2015 of being an accessory to the murders of 300,000 people at the Nazi death camp. But he filed an appeal for the sentence to be suspended. “Based on expert opinion, the superior regional court finds that the convicted individual is fit to serve out the term despite his advanced age”, said the court in Celle in northern Germany. Incarcerating Groening would not violate his fundamental rights, it said, arguing that “appropriate precautionary measures” could be taken to meet any special needs arising from his old age. Groening has been living at home despite his conviction, and given his age, it had until now been unclear if he would actually be jailed. Making the case for his imprisonment, German prosecutors have said that a court doctor has determined that Groening is able to serve his sentence, on condition he is given appropriate nursing and medical care while in detention. Groening worked as an accountant at Auschwitz, sorting and counting the money taken from those killed or used as slave labour, and shipping it back to his Nazi superiors in Berlin. He also on several occasions performed “ramp duty”, processing deportees as they arrived by rail in cattle cars. During his trial, Groening acknowledged “moral guilt” but said it was up to the court to rule on his legal culpability. He had testified that he was so horrified by the crimes he witnessed at the camp after his arrival in 1942 that he appealed three times for a transfer to the front, which was not granted until autumn 1944. Groening had previously been cleared by German authorities after lengthy criminal probes dating back to the 1970s. 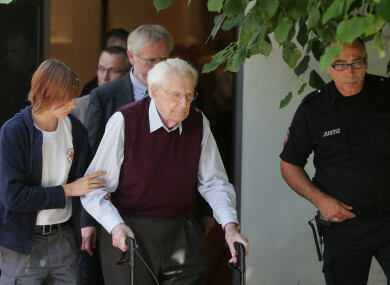 But a case was reopened against him as the legal basis for prosecuting former Nazis changed in 2011 with Germany’s landmark conviction of former death camp guard John Demjanjuk. The former guard was sentenced not for atrocities he was known to have committed, but on the basis that he worked at the Sobibor camp in occupied Poland and had thus been a cog in the Nazis’ killing machine. Demjanjuk died in 2012 before his appeal could be heard, but that verdict spurred new investigations against several elderly former Nazis. More than one million European Jews were killed at Auschwitz before it was liberated by Soviet forces. Yet, of the camp’s 6,500 SS personnel who survived the war, fewer than 50 were ever convicted. Email “'Bookkeeper of Auschwitz' (96) deemed fit to serve four-year jail term”. Feedback on “'Bookkeeper of Auschwitz' (96) deemed fit to serve four-year jail term”.